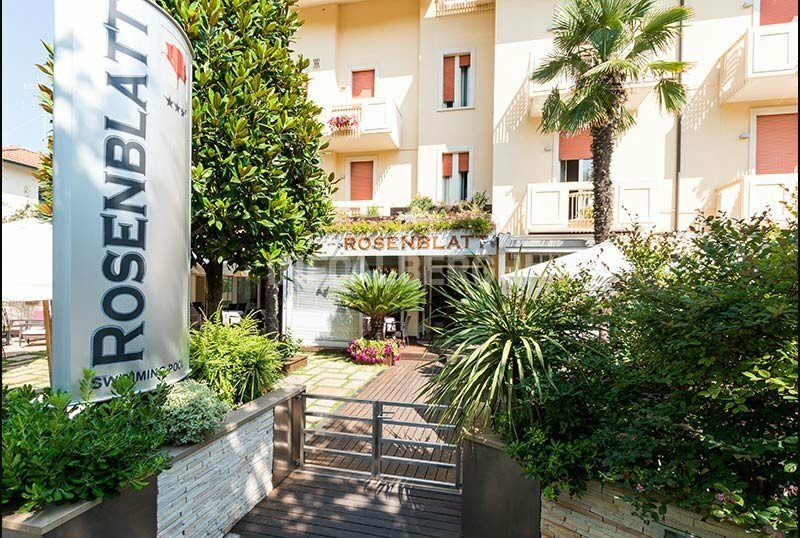 Hotel Rosenblatt , 3-star superior hotel in Cervia, is an elegant and modern hotel with a large heated swimming pool with hydromassage and solarium, gym, garden, children's facilities, parking and bikes available. The hotel is located in Cervia less than 5 minutes walk from the sea, in a central street and close to all the places of interest in the city: the charming old town and the lively canal with restaurants and trendy bars. All rooms are refined and elegant, with a modern and functional furniture. Each room has a balcony, air conditioning, TV, WI-FI internet access, mini bar, safe, telephone and private bathroom with shower and hairdryer. Heated swimming pool for adults and children with sunbathing area, sunbeds and beach umbrella, free use of bicycles, garden with sofas and tables, open-air porch, gym, reading room, bar, 24 hour reception with fax and photocopy service, lift, laundry service, Beach towel. PARKING: discovered for all guests. AIR CONDITIONING: present at no extra cost even in the room. CONVENTIONS: beach, gym and amusement parks. Possibility of organized excursions. LUNCH AND DINNER: 3-choice menu with dishes of sea and land, first courses and main courses to which are added the rich buffet of vegetables and snacks. Water is always included with meals. VARIATIONS: on request vegetarian and gluten-free menus. In the hotel: children's pool, outdoor playground area, strollers, baby / mini club, live entertainment and baby sitter service. At meals: baby food , baby food, baby menu, bottle warmer, high chairs, afternoon snack. In the hotel's garden there is a 130 sqm heated swimming pool, equipped with a hydromassage, a shallow water area for children, a waterfall, a solarium area with sun loungers, a fitness area on the terrace and water aerobics classes. The hotel has an agreement with the Imperial Bath n. 212, equipped with bar, restaurant, playgrounds, playground area, nursery, live entertainment. The prices listed are per person per day and are valid for a min. stay of 3 days. TOURIST TAX: not included: € 1,00 (April-May-September), € 1,50 (June-July-August) per day per person over 14 years old, valid for maximum 7 consecutive nights. - Short stay (less than 3 days): +10%. - Affiliated with Golf Club. 6 days in Full Board in All Inclusive Formula € 340.00 per person. Super offer from 17 May to 15 September, in Formula All Inclusive (with water at meals and Beach Service), starting from € 64.00 per day per person. Throughout the summer take advantage of our Family Discount for your holidays in Cervia! 2 adults + 2 children = 3 paying quotas. Request your personalized quote to know all the discounts for families with children. 7 days in Formula Beach, with full board, water with meals and beach service (umbrella and sun beds) included. Room with balcony, air conditioning, TV, Wi-Fi, minibar, safe, bathroom with shower and hairdryer. 7 days in Formula Beach, full board, water with meals and beach service (umbrella and sun beds) included.